You can do more research on the Internet than you assume. This is why we have compiled an overview for you. It shows the options of the World Wide Web, for instance to analyze competitors, find new customers, offer better products, select the right applicant or acquire information to assess your own company or products (so-called sentiment analysis). Image plays a major part in the success or failure of a company, especially when it comes to long-term survival. The Internet reveals what customers, media and others think about your company. a) Companies that have better ratings are listed in more prominent positions by Google. For instance, if a user searches for a hairdresser in Dresden, Google will position the best-rated hairdressers at the top of the list. This means that they have a better chance of acquiring new customers. b) Irrespective of Google, people and companies are more willing to do business with a well-rated company. There is a lively exchange of opinions on Facebook, Twitter und Co. For instance, opinions can be collected on your company’s Facebook page. You can also look for mentions of your company elsewhere on the social networks. 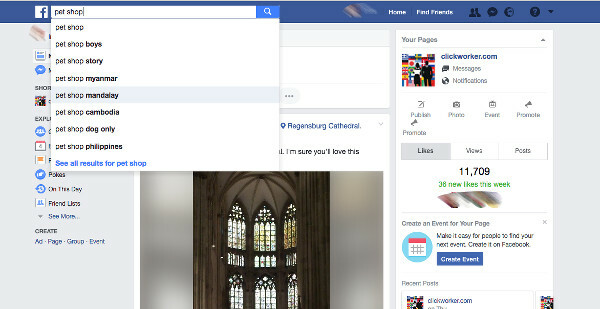 This search function can be accessed through Facebook since 2015. You simply have to type the respective keywords in the upper right. Doing research on Twitter is also simple. Here you will find the Search on Twitter with comprehensive setting options. Especially important when: You are interested in general tendencies and opinions. In general, every Internet forum has a specific main topic. The main topic is divided into subtopics that are further divided into single threads. This is where users exchange opinions and information. Forums can be found via Google. The search words are a combination of the main topic plus forum, for instance: photography forum, drones forum, pet forum, etc. You can of course create a forum on your own website in which users can exchange information, and search for opinions there. Since interested amateurs and experts generally visit forums, this is where you will likely find specialized information. This can include the appraisal of a new product for instance. Especially important when: You are interested in expert opinions. If you want to know what is being said about your company in real time then simply set up a Google Alert. The search engine will automatically inform you when your company is mentioned. Especially important when: You are interested in current opinions. Review sites are an initial starting point for many customers seeking information about a company. They check to see whether an online shop is reliable or whether there is a good hairdresser in the neighborhood. As a company, you will rely on these portals. Users will make a purchase decision based on the opinions they come across there. Yelp is the most well-known review portal. On Yelp the community gives grades to service providers, restaurants, delivery services as well as clubs, movie theaters, etc. Reviews of local service providers. Fewer entries than on Yelp, but very extensive in some regions. This site provides numerous reviews about restaurants, clubs, doctors, and craftsmen in various parts of Germany. There are, in addition, numerous portals that are specialized on reviews of specific service providers. Especially important when: You want to see how your company and its services are appraised at a glance. If your company manufactures and/or sells products you are obviously interested in product reviews. Based on these reviews, you can assess which products are doing well and why some are difficult to sell. Assessments also make an analysis possible, enabling improvements to the item and calculations of future developments. Amazon has now superseded Google as a product search engine. Your customers will therefore most likely search for your items on the Amazon marketplace. On the overview page of the product search you can see how well the customer likes the item. To give users of price comparison portals added value, these portals also provide more than the best price. They also offer reviews about the items listed. The most well-known portal is Dooyoo. It often includes detailed test reviews written by consumers. 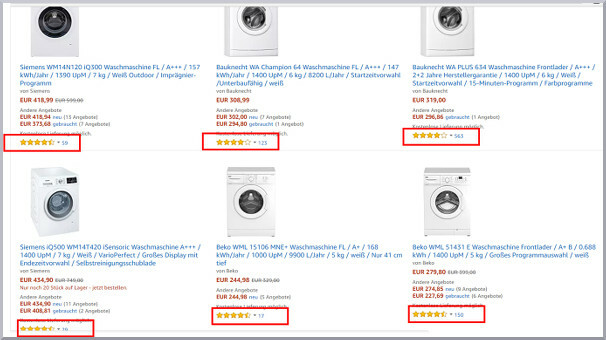 Check24 also lists reviews along with the product search, as do Preisvergleich.de or Idealo. Test portals usually have the products tested by professional testers. The most popular German portal is the Stiftung Warentest site. Many test magazines also have portals in which their product tests are printed in the hard copy issue. However, there are numerous “black sheep” among the test portals. These are pages that compile the results from other sources. You will not find realistic appraisals of your product there. In addition, these tests are always sugarcoated so that the user clicks on the corresponding Amazon link and purchases the so-called “great” product. Is your competitor getting higher rankings on Google? Does their Internet page look better than yours? Are their reviews more positive than yours? Are they offering activities that attract customers? Are they an attractive partner for other companies? These are all questions that can be answered through Internet research. How do I find my competitors? Is your company searching for a new partner? Then proceed as in the Internet research for companies (see 1.). You will quickly find someone who matches, and with whom the customers or other companies are satisfied. Absolutely! It simply takes two or three steps to find them. The number depends on whether you are active in the B2B or B2C sector. First determine who needs your product or your service. Simply define your potential customer. Once you know who you are looking for the easier it will be to find them. If you haven’t got a detailed idea of your potential customer, then search the Internet for companies that offer similar products and services. You might find customer reviews listed there. You will find more information in review portals. You can even address your competition’s customers directly in forums. If you work in the B2B sector, you will find the addresses of potential customers in the yellow pages, in trade journals or in magazines and specialized journals. Fair catalogues are also a good source. Generally all of these sources are available on the Internet. You can also search for potential customers on price comparison portals, or portals for the assessment of services. If you work in the B2C sector, then you will need a well-planned and implemented marketing campaign. We have published various articles on the subject in our blog. “Generating leads online: The 10 best tips“, “Landing page: How to set it up and avoid mistakes” or “Paid search results versus organic search results“. You can also search forums for dissatisfied customers, and offer them your products and services. In the B2B sector it is important to find the right contact person. They can usually be found on the Internet page of the company. A glance at the Facebook page or the forum of a company can also be helpful. The ideal contact person is someone who acquires the funds for the order and is authorized to place an order; someone who understands the necessity of your product/service for their company. This step is obviously unnecessary in the B2C sector. As the trade association “bitkom” discovered in June 2015, approximately 46% of personnel managers do research on their applicants in social networks. In 89% of the cases they are interested in the professional qualifications, and in 72% in the public statements about specialist subjects. 56% of the personnel managers are interested in statements about the company or its competitors. 44% percent are interested in the hobbies and personal activities of the applicants, and 34% take a closer look at public photos. You can of course also be active. Are you looking for a new IT staff member? You will certainly find someone if you search in the right networks. You are only allowed to search for information that is available to the general public. This is only the information that can be accessed without signing-in on a network. The question of whether information can be used that has been accessed after signing-in is legally contested. This is why one distinguishes between professional and recreational networks. On professional networks employees obviously want to present themselves. This is why it is quite safe to use them as a source of research. However, it is forbidden to obtain information under false pretenses in recreational networks. In short: You may not send friend requests to applicants to gain access to the posts submitted in their circle of friends. Whether you can use posts that can be accessed by everyone in recreational networks for applicant research is contested. There is no clear regulation yet. However, the borders between recreational and professional networks are often blurred on Facebook, as the Facebook applications BeKnown and BranchOut prove. Companies profit from Internet research in many areas of their business. You can monitor your image. You can observe products and services on the market. You can keep an eye on the competition. You can find new partners. It is easier to find potential customers. Suitable applicants are found more quickly. You can get assistance with Internet researches using the web research services at clickworker. Dieser Artikel wurde am 13.June 2017 von Thomas geschrieben.